One of the fascinating quirks of humanity, studied by scientists ranging from behavioral economists to psychologists, is how our perceptions of events are shaped as much by our expectations as by objective realities. Because we compare outcomes to our expectations it is easy for us to make a number of cognitive mistakes, including confusing something getting better for something getting worse, and vice versa. The national debt is a case in point. The tenor of much recent coverage is that the federal debt is a fading problem, even though by any objective measure it is a serious one in the process of getting rapidly worse. That the federal debt situation is worsening is easily seen by looking (see Figure 1) at the latest projections from the Congressional Budget Office (CBO). Throughout the whole time CBO has made estimates, federal debt held by the public never exceeded 50 percent of GDP until 2009 when it began to rise dramatically, eventually reaching roughly 75 percent of GDP this year. CBO now projects that we will continue to accumulate debt at unsustainable rates, exceeding 85 percent of GDP by 2026 and continuing to grow to eventually exceed our entire domestic economic output. Viewed objectively, our debt situation has grown much worse in recent years and is projected to grow still worse in the future. Strangely, levels of concern over the national debt do not reflect this reality. A Google Trends search of interest in “national debt” within the US turns up far less during the last two and a half years than during previous years, when interest peaked prior to the 2008 and 2012 presidential elections, and during the debt ceiling negotiations of July 2011. Coverage of the issue by economic reporters now typically treats the debt problem as having become “less bad.” Even presidential candidates are running on platforms to increase the national debt rather than reduce it. Why is this? The answer may lie in comparisons with prior expectations. In reality, things may be getting worse. However, if you expected them to be worse still, you can fool yourself into thinking they are getting better. A version of this appears to be at work with respect to perceptions of the federal budget situation. What has improved is not the current reality of the federal budget but rather future expectations relative to some previous expectations. Here’s how reporter Greg Ip puts it in one article: “The real problem was never the debts the U.S. incurred at the depths of recession, but those that will pile up in coming decades as an aging population sends the bill for Social Security and Medicare through the roof. It is on that front that the outlook has changed for the better. . . One reason for the reprieve is plunging health-care inflation. . . The second factor is interest rates.” If both interest rates and health care costs are lower than previously expected, then future deficits and debt are likely to be as well, all other things being equal. But look more closely; this would not mean that the debt situation is actually getting better. It would merely mean better than some previous projections. The distinction is enormously important for policy making. What matters from a policy perspective is the current collection of facts as well as current expectations for the future. Previous expectations are irrelevant to the policy choices now before us. Those prior expectations may influence our emotions and attitudes as we go about the task, but they are a distraction from the objective of setting optimal policy going forward based on what we now believe. To establish the right policies for the future it should not matter what we thought five or ten years ago, when we did not have as much information as we have now. What’s remarkable about our national confusion on this point is that not only is the current fiscal situation now worse than in prior years, it is also actually worse than previous projections. This can be seen by comparing current federal debt held by the public to CBO’s baseline projections in previous years, as in Figure 2. This figure is worth examining in some detail. 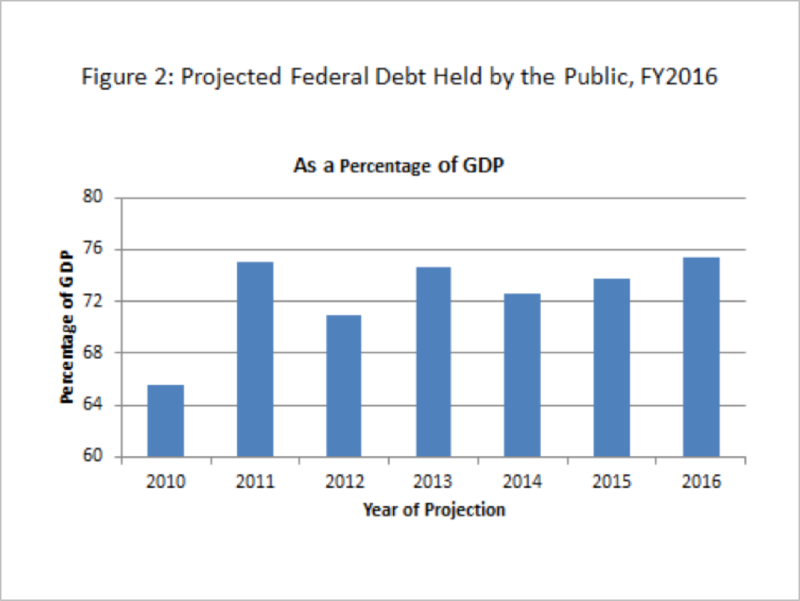 CBO’s most recent analysis estimates federal debt held by the public at 75.4 percent of GDP for FY2016. This is worse than we thought it would be at this time. It’s a lot worse than the most optimistic projections made in previous years, and even a little worse than the most pessimistic ones. 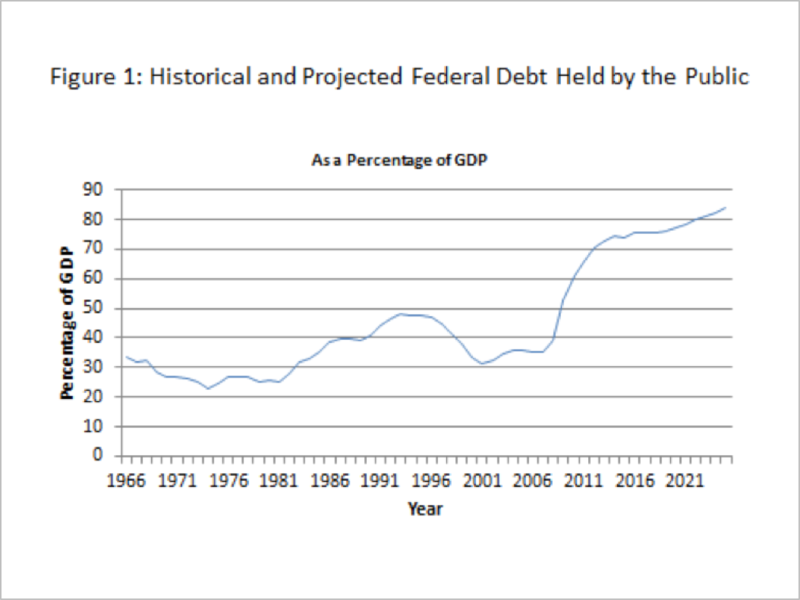 For example, in January 2011 CBO projected that the public debt would climb to 75.0 percent of GDP by FY2016. After that 2011 projection, most recent ones have been slightly less dire. But this year’s debt percentage is actually worse than all of them. (The worsening is actually more than can be seen in the figure because of changes to GDP measurement introduced between the 2013 and 2014 projections). Not only are things a little worse than we recently thought they’d be, they’re a lot worse than we expected several years ago. For example, in January 2010 the baseline debt projection for FY2016 was 65.5 percent of GDP, substantially less than current levels. In January 2009 the FY2016 projection was only 46.4 percent of GDP. In January 2008 the FY2016 projection was a mere 26.4 percent of GDP. So no, the fiscal situation is not getting better. It’s worse than it was before, and it’s worse now than previously projected. The best we can say is that current long-term projections don’t look as bad as some previous long-term projections. To fail to make necessary fiscal corrections because of confusion engendered by prior expectations would be a highly damaging indulgence of cognitive bias. This commentary was originally published in Economics 21.